And then you reach the top and it's like "I'm so glad I did this". It is always worth it. Sometimes when I'm writing a new recipe I think the same way. All the baking, lots of layers, two kinds of fillings, creaming and whipping, and heating and cooling... so much waiting and glazing and finickying. There's all the worry of "what if it doesn't turn out?". I think about the potential waste of chocolate... Why? Why do I bother doing it? Because in the end I'm always like "I'm so glad I made this". This is delicious. 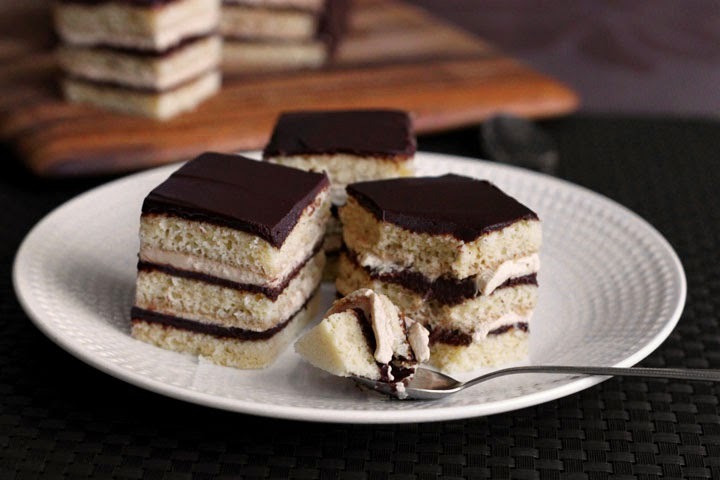 Opera cake is one of those recipes that's like "ugh! Why?" There are so many layers and so many instructions. There's lots of waiting time in between baking and cooling and I have better things (if you call sleeping in and then watching lip sync battles on Jimmy Fallon all day "better") to do on a Sunday. But man does it ever taste like a slice of blue sky when you eat it! I'd say that this version I made today is worth the effort only because there's really not that much effort. It's a bit cheaty because I still want to sleep in and be able to eat it on the same day. 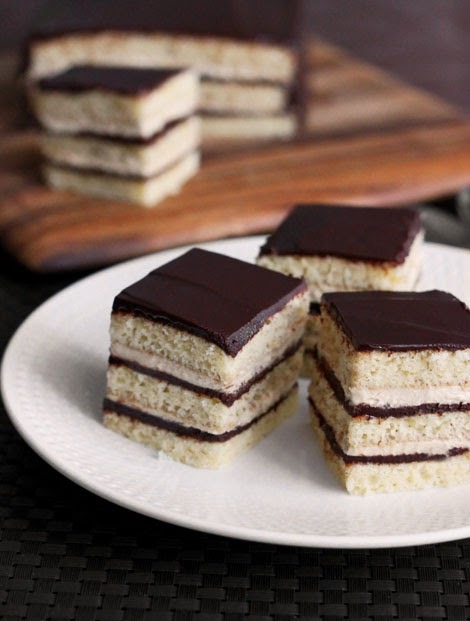 The essence of the Opera cake is the sponge. An almond sponge to be exact, and three layers of it. This particular almond sponge cake is called a "joconde" and it is made from whole eggs, egg whites and ground almonds. It can be a bit firm and sometimes on the slightly denser side compared to other sponge cakes but that is necessary since it needs to withstand layers of cream and chocolate. My cheat's version is surprisingly easy to make and I promise you only need one baking pan even though there are three layers. First you need to whip up those egg whites with granulated sugar until stiff peaks. Separately we whisk ground almonds, icing sugar and whole eggs together until thick and lightened by a few shades. A bit of vanilla and salt goes in too, you know the drill. To this we sift in flour and then fold through the whipped egg whites and melted (but cooled) butter. Spread it all out in a standard jelly roll pan that's lined with parchment paper and bake until springy. The cream filling is easy and delicious. Just whipped cream with brown sugar and coffee. Perfect. 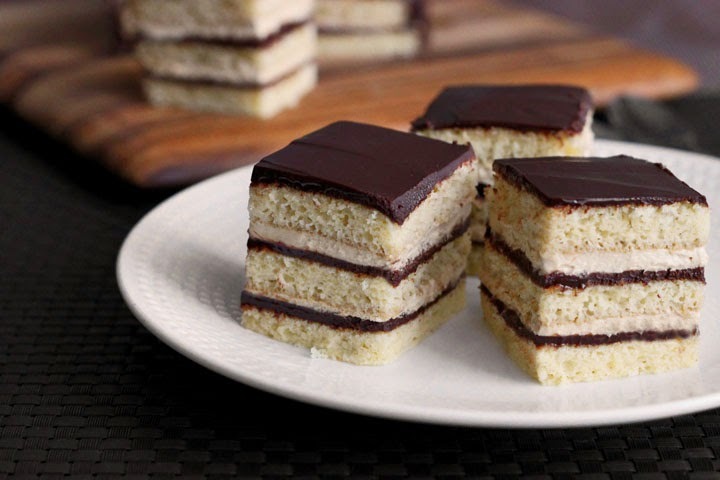 No Opera cake is complete without layers of chocolate. The original would have a "mirror glaze" which is a super shiny chocolate glaze made from cocoa and gelatin. It involves blooming and whisking and fine straining. Today it's just chocolate, butter and milk. I made it in the microwave. We can do this! Slice your sponge width-wise into 3 equal rectangles and slather the chocolate filling on top followed by a shmear of the coffee cream. Repeat once. On the last layer, cover it only with the chocolate ganache and let it set. We can be both fancy and clever. No one needs to know you didn't sacrifice your whole weekend for this. No one needs to know that you didn't change out of your pajamas today. It's so easy that you can make two, and this one can be all for you! Preheat oven to 400°F/200°C and line one 9x13-inch, 1 cm deep baking tray with parchment paper. In the bowl of a stand mixer fitted with a whisk attachment, whip the egg whites with salt to soft peaks. Gradually add the sugar and continue to whip to stiff peaks. In a separate large mixing bowl, combine almonds, icing sugar, eggs and vanilla extract and beat on medium speed with an electric hand mixer until lightened and increased in volume, about 3 minutes. Turn the mixer down to low and add the flour, mixing just until it disappears. Gently fold in the meringue. Lastly, fold in the melted and cooled butter. Spread the batter evenly into the prepared pan. I only used about 3/4 of the batter for a thin sponge in a 13x9-inch pan. Bake for 7-8 minutes, until lightly golden. Remove from the oven and let cool for just a minute. Cover with a sheet of parchment, then flip the pan over on the counter top to turn the layer out. Carefully peel off the top layer of parchment and let it cool. Once cool, slice the sponge widthwise into 3 equal-sized rectangles. To make the coffee cream, whip cream just until thickened. Add coffee granules and brown sugar and whip until soft peaks. To make ganache, combine chopped chocolate, butter, milk and salt in a bowl and microwave on 50% power for 2 minutes. Let stand and then stir until glossy and smooth. Spread ganache evenly over two of the joconde sponges and refrigerate until set. Place one sponge on a piece of parchment and spread cream over ganache. Place the other ganache-covered sponge on top and spread over another layer of cream. Place the third (plain) sponge on top and chill 15 minutes. Cover with a thin layer of ganache and chill 30 minutes. Pour remaining ganache over top and spread to cover. Refrigerate 1 hour before serving. 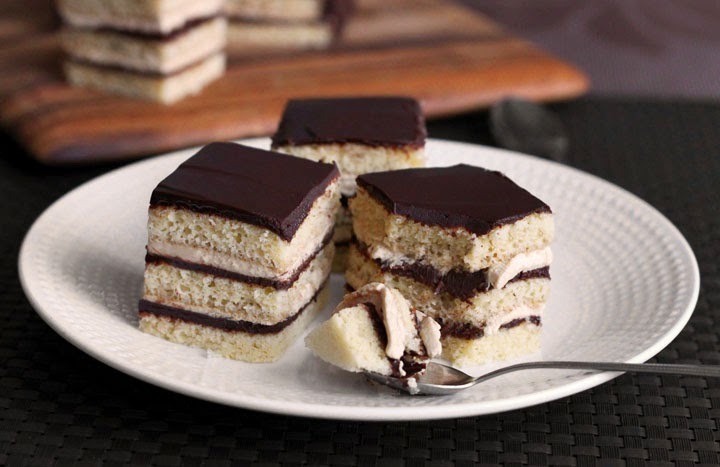 Opera cake is one of my favorites, and this looks eminently do-able. Any recipes for a yummy Princess Cake? I will be making this as our Easter dessert. Thanks. 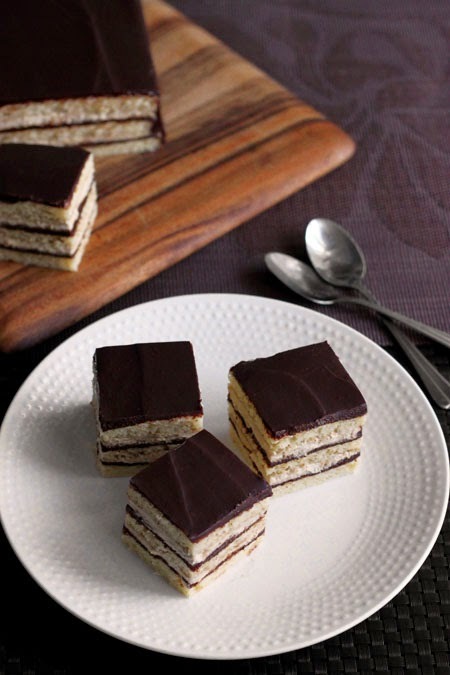 I have never tried Opera cake before so I am definitely eager to give this a go! YUM!